Putting Me Through The Mill! 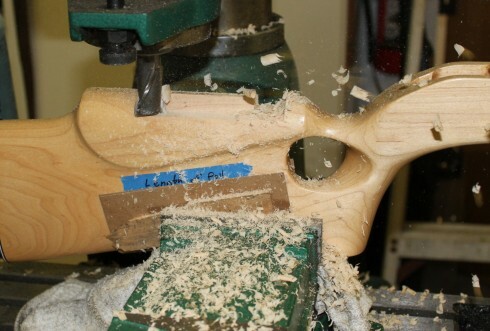 As I mentioned in my last update there were some issues with comb height and length of pull on the stock. While it was fine for iron sited rifles it was not for scoped ones. 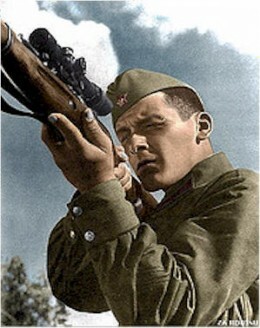 The goal was to be able to raise the shooter eye level to a point so that the optics fall into proper alignment, Mark, Noel and Alan and I had plenty of discussions that ranged from buying a new stock to going to iron sites for Moszilla. None of that was what I really wanted to do. So after some brainstorming with Alan and the guys at TTI, we came up with an idea. I really enjoy working with these guys, I’ve found them highly knowledgeable and they’re just very cool to work with. Gulp! Well there is no turning back now. 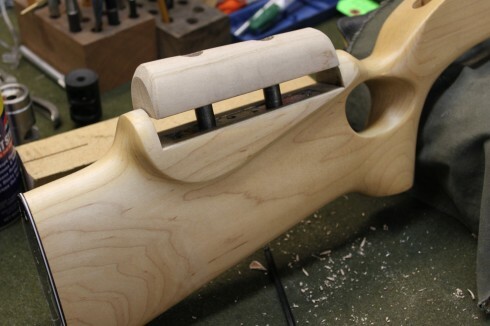 So Alan began the mods by milling out the stock, during this operation he added a slot for the the new hardware that will be recessed into the lower portion of the stock. You’ll also notice that in the bottom of the milled area there has been a slot milled, this as well as the 2 holes that have been drilled to support the new hardware. The hardware is going to be custom built as well. We’ll soon have a cheek that us totally adjustable in height. Hardware Installed in upper and lower portion of the stock. 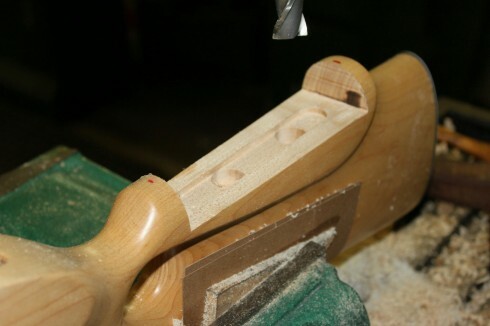 With the stock milled and hardware installed Alan begins to make a new cheek from a piece of Hard Rock Maple stock. This was hand shaped to make sure it matched the original shape and color. The new adjustable cheek was test fitted and bolted in to make sure all is well with the modifications. Now the height can be adjusted by changing out the spacers on the cheek. Pretty cool eh? As you can see the MosZilla is coming along quite nicely. The guys have done a spectacular job on the mods. There is still some more work that needs to be done on the stock to correct the length of pull issues. That will be resolved soon as well. I can’t wait to get this rifle to the range for a day of shooting. Well that is all for now, keep an eye out for another update soon. “To preserve liberty it is essential that the whole body of the people always possess arms and be taught alike, especially when young, how to use them…” -Richard Henry Lee writing in Letters from the Federal Farmer to the Republic (1787-1788).